While the wage gap between men and women continues to shrink, such equitable momentum hasn't come to all occupations. In the U.S., the adjusted pay gap has dropped from 6.5 percent in 2011 to 4.6 percent in 2018, however equal wages for similar workers may not be a reality until 2070, likely even longer for women employed in male-dominated fields. That's according to an analysis of more than 425,000 salaries shared by full-time U.S. employees by Glassdoor. Glassdoor controlled for factors such as education, employment history, and job title, to determine those figures, allowing for a true apples-to-apples comparison of workers, indicating that even when employees are identical apart from gender, women make less for the same work. Women earn the smallest share of a similar male coworkers' salary when they pursue jobs or work in industries dominated by men. 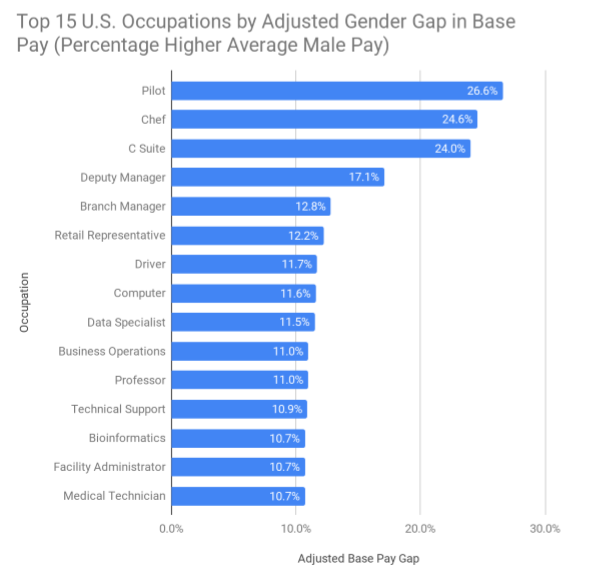 In 15 such occupations, the adjusted salary gap between female and male workers with the same job title is more than double the U.S. average adjusted gender pay gap of 4.6 percent. Male pilots, for instance, take home salaries 26.6 percent higher their female coworkers, on average, Glassdoor found, meaning these women earn only 73 cents for every dollar paid to male pilots. That's the largest pay gap of any job in the nation — more than five times larger than the national pay gap, too. Female chefs and C-suite executives suffer similar workplace biases, earning 24.6 and 24 percent less than their male counterparts, respectively. 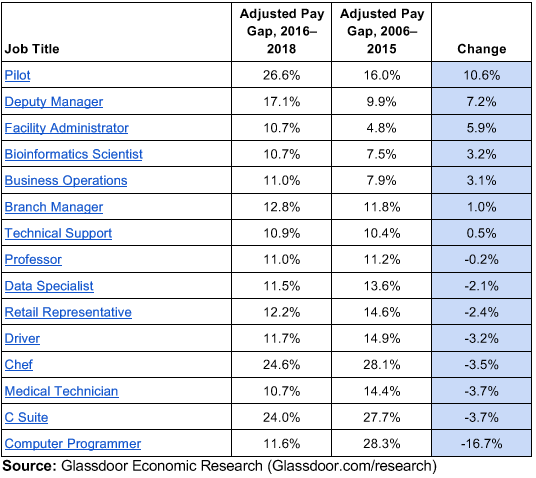 And such pay differences are growing in about half of these occupations. From 2006 to 2015, the average, wage disparity between male and female pilots was 16 percent, while deputy manager positions experienced a gap of 9.9 percent. Still, the news isn't all grim. The other half of these occupations appear to be actively working to address their pay biases. Female computer programmers earned 28.3 percent less than male coworkers, on average, between 2006 and 2015. Today, that's dropped to 11.6 percent.